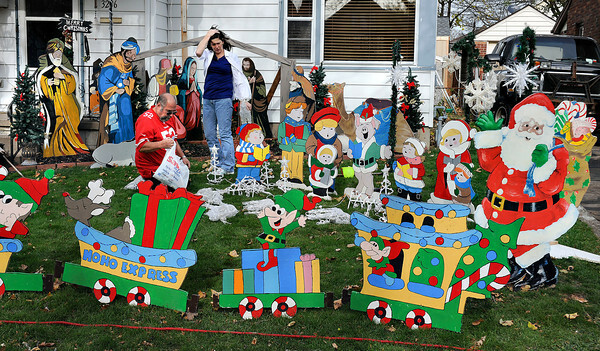 James Neiss/staff photographerNiagara Falls, NY - OVER THE TOP: "Go big or not at all," may be the theme for John and Dawn Irace of South Avenue, who's Sunday project was to set up their hand-made Christmas decorations. The couple, said they have been building the collection for over 15 years and Sundays balmy weather was the perfect time to set it up. Furthermore, with all the talk about retailers getting a jump start on Christmas holiday sales earlier this year, some might appreciated that the couple said they will not turn on the power for the display until the day after Thanksgiving.